The decision to invest the time to learn how to use billionaire strategies for growth is a major one. For those trying to decide which way to go, this new report looks at what’s involved. It will not only provide you with an understanding of why it makes sense to go this route, but the hurdles as well to getting started and succeeding. By the end of it, you will have a good feel for whether or not you’re suited to using this as your primary or secondary growth strategy. Let your decision be an educated one. 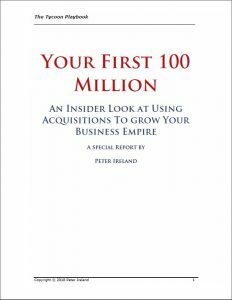 One Response to Your First 100 Million: Are You Up For It? You really should double the price on this one. The financing section is worth $100 alone.